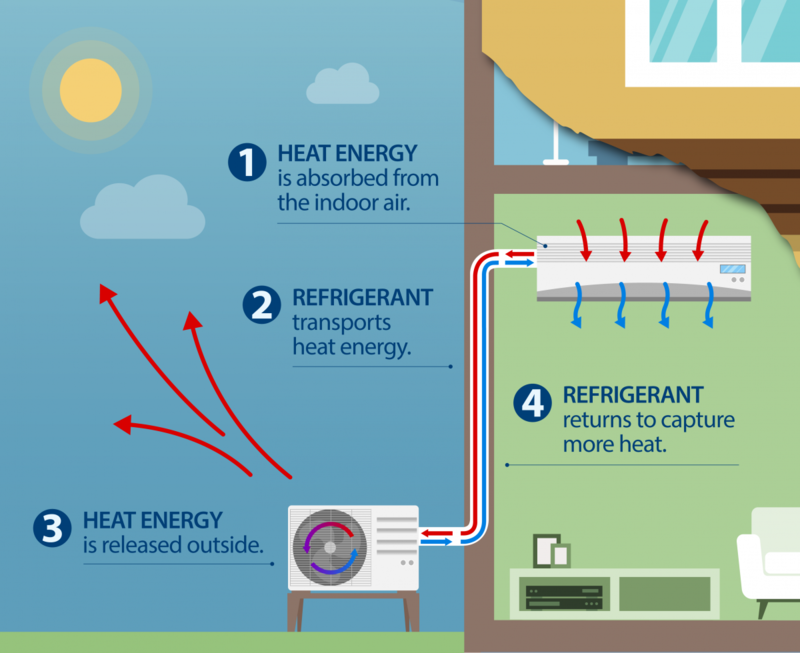 On average, about half of the energy you use goes to heating and cooling your home1. That’s why it’s important to choose an HVAC system that will save energy, save money, and keep you and your family comfortable for years to come. Heat pump technology is a leading-edge solution for high-efficiency heating and cooling. A heat pump system can be a great alternative to a traditional furnace or other heating equipment, and also provides a simple way to introduce central air conditioning to your home. 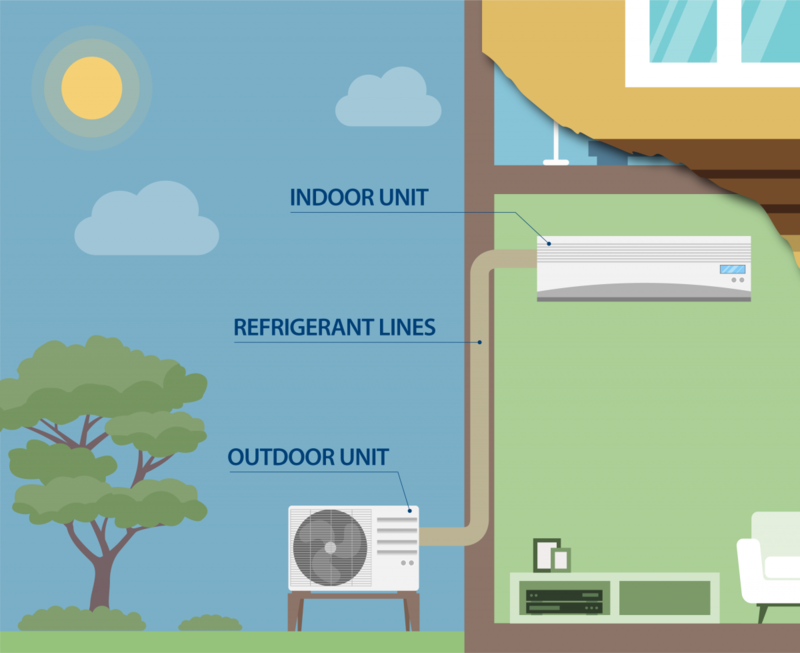 Did you know you already have a heat pump in your home? Though heat pumps are rapidly gaining recognition across the United States as a smart solution for residential HVAC, basic heat pump technology has been around since the 1850s. You may not realize that refrigerators, freezers, and air conditioning units are heat pumps, which use a substance called refrigerant to move heat energy from one place to another. The technology is also used in high-efficiency electric water heaters. Unlike a gas furnace or wood burning stove, heat pumps don’t create heat; instead, they move heat from one place to another. This is possible because heat is naturally present in the earth and air, even when it is cold outside. Essentially, a heat pump functions as an air conditioner that can also work in reverse. 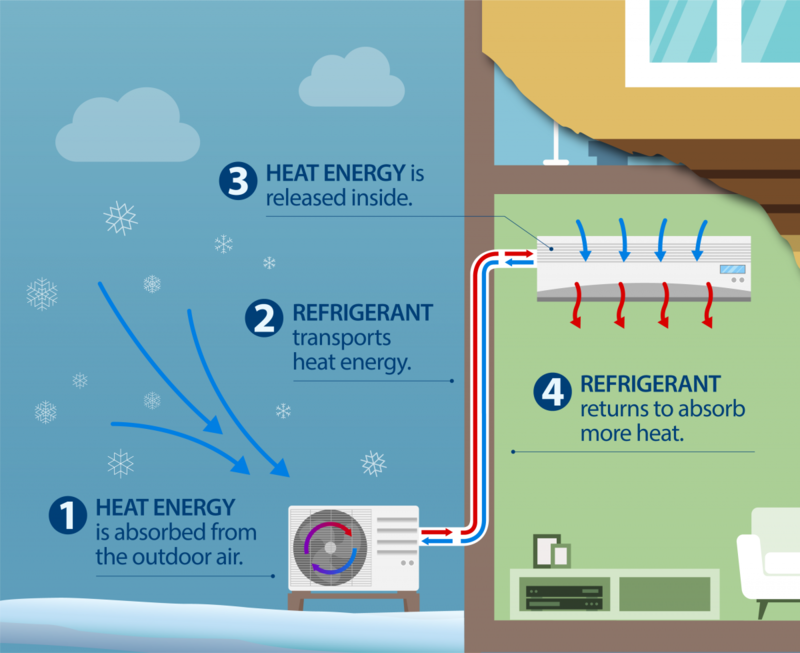 In the summer, the equipment moves heat from inside to outside the home; and in the winter, heat is transferred from outside to inside the home. Efficiency. Heat pumps use considerably less energy to heat and cool your home, all year long. Convenience. Since a heat pump system is powered by electricity, you won’t spend time filling tanks, cutting or hauling wood, or dealing with the risk of fuel shortages or seasonal price fluctuations. Comfort. With heat pumps, you have more control of your comfort. And, thanks to modern features, you can enjoy consistent heating and cooling with quiet equipment operation. Health. Heat pumps have an air filter that removes harmful particles from indoor air. Many models also provide dehumidification, reducing the likelihood of mold and mildew. Safety. Since a basic heat pump is not powered by natural gas or propane, you have less risk of leaks, fires, and carbon monoxide poisoning. Cleaner environment. Electric-powered heat pumps are designed to produce zero emissions on-site, and can utilize renewable energy sources like wind and solar—thereby reducing your environmental impact. When considering a heat pump system, it is imperative to purchase the most efficient model you can afford. While higher-efficiency heat pumps cost more upfront, the initial investment will pay off in lower operating costs and better comfort for years to come. To assist with your heat pump purchase, the Energy Optimization program provides cash incentives for heat pumps that meet minimum energy efficiency ratings. All heat pumps include efficiency ratings based on manufacturer testing to help consumers anticipate how well the heat pump will perform. Developed by the Air-Conditioning, Heating, and Refrigeration Institute (AHRI)—and used by the U.S. Department of Energy (DOE)—the ratings listed below are important for you to consider when gauging efficiency levels/operating costs and ensuring the heat pump you select qualifies for Energy Optimization program rebates. Generally, for each of the above ratings, higher value = more efficient. The Energy Optimization program provides cash incentives for both air-source and ground-source heat pumps—as long as the equipment you purchase meets minimum efficiency standards. Visit the Efficient HVAC webpage for your utility to view minimum ratings and incentive amounts. Affordable financing for energy efficiency improvements is also available from Michigan Saves. Learn more about the different types of heat pumps below. The most common type of heat pump is an air-source heat pump. This type of system absorbs heat energy from the air and transfers it through refrigerant lines. At moderate temperatures, air-source heat pumps can operate at up to 400 percent efficiency, delivering four times more heat than the electrical energy they consume. Whether you choose a ductless or ducted system, inverter-driven heat pumps are the quietest and most advanced models on the market. Unlike other air-source heat pumps, these systems provide consistent temperatures and the greatest electric savings by self-adjusting their speed and capacity for heating (and cooling), depending on the outdoor temperature. For a colder climate like Michigan, inverter-driven heat pumps are the best available option. Ductless systems with more than one indoor unit allow for different temperature settings throughout different parts of the home (zones)—providing optimum comfort for your entire family. Installing a ductless heat pump system is easy, non-intrusive, and quick: A professional contractor can complete installation in less than one day. Only a small three-inch hole in an exterior wall is needed to connect the refrigerant line from the outdoor unit to the indoor unit. Ductless air-source heat pump systems can be 15-20 percent more efficient than ducted systems because a blower motor is not needed to blow conditioned air throughout the home, and risk of air leakage in the ductwork is eliminated. In this application, conditioned air travels through your home's existing ductwork. In many cases, a heat pump can be added on to a home's existing furnace. When the heat pump is being used, the furnace functions simply as an air handler (to move air through the ductwork). Installing a ducted heat pump is similar to installing a central air conditioner, and can be completed in one day. Work with your contactor to ensure all required components are compatible. Since heat pumps draw renewable heat energy from the outdoor air, they must work harder as temperatures fall—impacting efficiency. For example, while the most efficient air-source heat pumps can operate at up to 400 percent efficiency in moderate temperatures, the same models may achieve an average heating season efficiency of about 250 percent—which is still excellent, considering conventional heating sources cannot exceed 100 percent efficiency. While heat pump technology is advanced enough to function in below freezing temperatures, many Michigan homes with air-source heat pumps will need supplementary heat for the coldest days and nights of winter. During these times, the heat pump will not run as efficiently, and may not provide as much heat as you need. Supplemental heat can come from a variety of sources, such as an existing furnace or boiler, electric baseboards, wood burning stoves, or even space heaters in the areas of your home you most frequently occupy. Conveniently, ducted heat pump systems can easily integrate with most newer gas furnaces, just like a central air conditioner would. Note that extremely well-insulated and air-tight homes with inverter-driven ductless heat pumps may not need a backup heating source. All-electric ducted heat pumps contain built-in electric resistance coil heaters that can operate simultaneously with the heat pump, to provide 100 percent of your home’s heating needs on the coldest days. If your goal is to eliminate gas entirely, this is a good option. An existing gas furnace would be completely replaced with the new heat pump and air handler. A system with backup natural gas or propane is another option for providing supplemental heating. Like a central air conditioner, in this configuration, the heat pump is often attached to the top of the gas furnace. 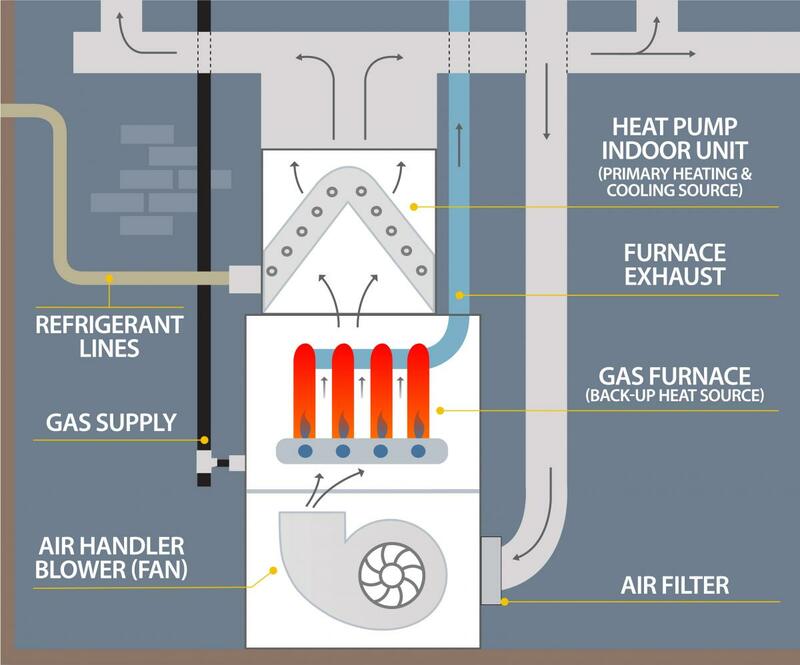 In the winter, when the outdoor air cools to a predetermined temperature, the electric heat pump shuts off and the gas furnace takes over—supplying heat as the conventional furnace you’re used to. You can also manually control which heating source is used to minimize your heating costs. To decide whether an all-electric or dual-fuel ducted heat pump is right for your home, consult with your HVAC contractor. In either case, be sure to purchase an inverter-driven heat pump to maximize the time the system operates in heat pump mode—which will provide the greatest energy and cost savings. 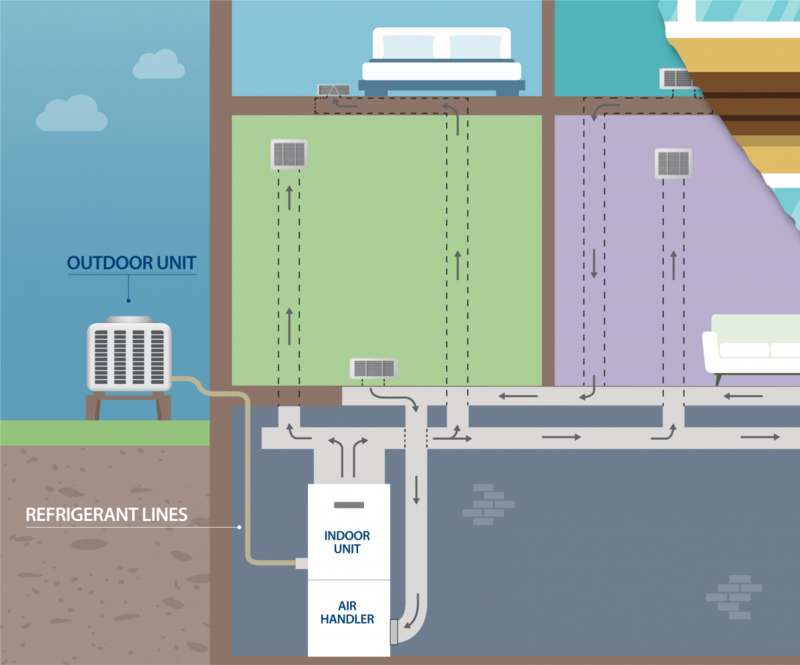 Another type of heat pump is a ground-source (or geothermal) heat pump. Instead of drawing heat from the outdoor air, heat is absorbed from the earth (or ground water). Ground-source heat pumps can provide both heating and cooling for the home and, in some instances, supply domestic hot water and dehumidification. They can operate at up to 500 percent efficiency, delivering five times more heat than the electrical energy they consume. 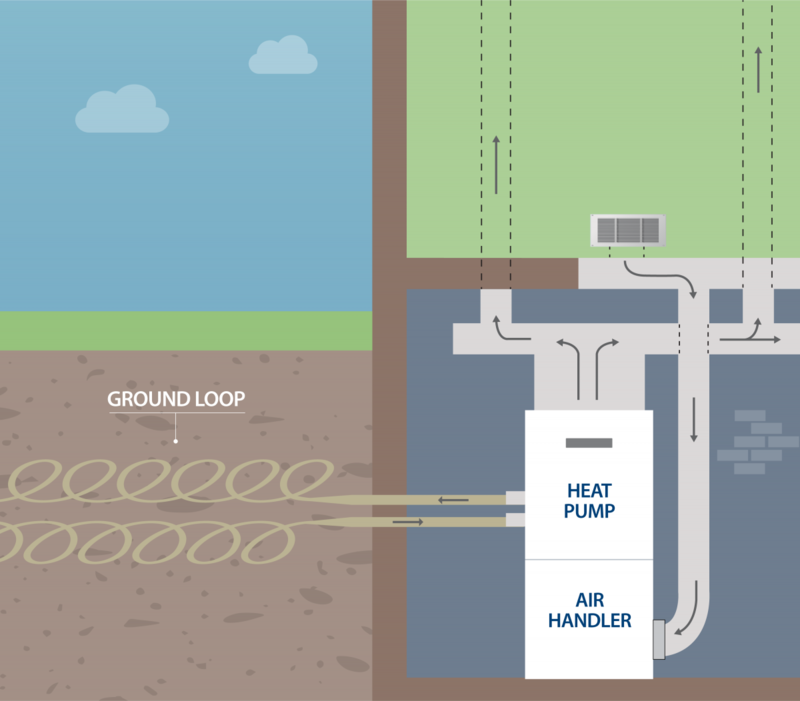 Generally, there are two different types of ground source heat pumps: Open loop (which use an existing or new water well) and closed loop (a loop of pipes in the ground or body of water, placed below frost level). *In open-loop systems, water exiting the heat pump can be drained into the ground, a well, pond, etc. (in compliance with local codes). Despite fluctuations in seasonal air temperatures, the soil and water just a few feet below the Earth’s surface remains at a relatively constant temperature. This enables ground-source heat pumps to deliver sufficient heat on the coldest winter days, and to operate at higher efficiencies than air-source heat pumps. 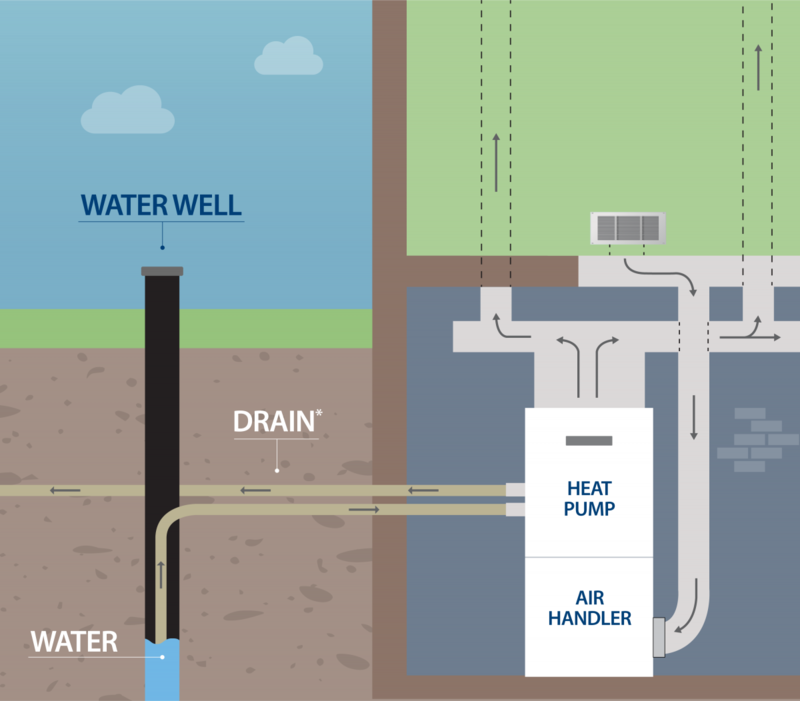 While ground-source heat pumps are more efficient and typically do not require a backup heating system, they do cost more upfront and may require excavation. There are pros and cons to each type of heat pump, and many factors—such as your budget, current heating system, and the characteristics of your property—will determine which option is best for your home. Keep in mind that in addition to Energy Optimization program incentives, there is a 30 percent federal tax credit available for ground-source heat pumps through December 31, 2019!